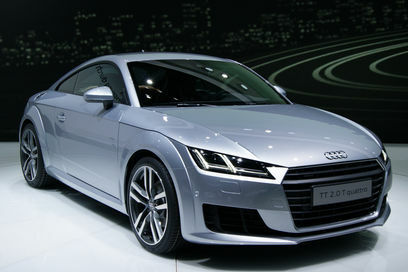 Home » Cars » Introducing the New Audi TT! Ohhh Gosh. It’s the new Audi TT and it looks bloody awesome. To be honest I’ve always pied the TT off as a bit of a girly car for hairdressers (no disrespect to hairdressers), however the new one actually looks pretty blokey, a little more squared and aggressive rather than round a bubbly. Despite maybe looking manlier, the Audi TT has also managed to lose weight and become more agile. Changes have also been made to the TTs interior. The Cabin is built around the excellent Virtual Cockpit System which is very unique. Rather than having a screen in the centre, Audi have opted to put the screen directly behind the steering wheel. The standard TT comes with climate control, DAB radio and leather seats. Prices start at £29,770 and can get as high as £35,335 depending on which model and trim you go for, making this the most expensive TT yet. Though as far as we can tell the price is justified: From what we have heard it is great fun to drive as well with improvements made to performance and handling. Whilst performance has improved C02 emissions have been kept low, especially for a sports car at 120g/km. Furthermore it should retain its value pretty well, so selling the Audi TT second hand shouldn’t leave you with tool much of a loss. So if you viewed the Audi TT the same stigma that I have done, it might be time to consider it as a proper good car! By admin in Cars on September 16, 2014 .